Clean Carfax and One Owner! With its accommodating interior, easy manners and stellar reliability record, the 2016 Toyota Sienna remains at the top of the class among minivans. Just off a freshening last year that granted updates inside and out, the Sienna continues to earn its status as an exemplary choice for growing families. The Sienna's styling remains more conservative than that of the Honda Odyssey and revamped Kia Sedona, but on the inside where it counts, Toyota's minivan boast features pragmatic and entertaining – perfect for keeping kids safe and placated. The Sienna offers seating for seven or eight, and remains the only minivan to offer all-wheel drive (AWD), a boon when driving in foul weather. Add in terrific resale value, and the Sienna's star shines all the brighter. If you want a minivan with simple operation, stellar reliability and traditionally handsome design, the 2016 Sienna is a no-brainer. Class-leading resale value and the availability of factory-installed hardware for passengers with mobility needs are other merits, as is the option of traction-enhancing all-wheel drive. Coming off a freshening just last year, the Toyota Sienna arrives for 2016 with only minor updates that include upgraded multimedia systems that now have Siri Eyes Free mode for use with Apple iPhones and the Scout GPS App link for navigation powered by smartphones. As part of last year's update, the Sienna is now put together with an additional 142 spot welds. It’s not something owners are likely to brag about to the neighbors, but the stiffer platform is part of the reason the latest Sienna is more satisfying to drive than past models. The familiar 266-horsepower V6 continues to deliver ample power, while the 6-speed automatic transmission deftly manages that output. Responsive enough around town and now quieter on the highway, the Sienna is about as satisfying to drive as an 8-passenger troop transport can be, and it’s even more rewarding for passengers. For those seeking a more dialed-in driving experience, the SE trim offers a sport-tuned suspension and 19-inch wheels. Both features improve handling but also result in a harsher ride and more road noise inside the cabin. As the only minivan in the segment able to put power to all four wheels, this option is the one to have if you regularly find yourself driving in snowy or slick conditions. For passengers who require mobility assistance, the Sienna can be a savior. In addition to its ability to be fitted with an aftermarket wheelchair ramp, the Sienna is available with Toyota's factory-installed Auto Access Seat, a power-operated chair that enables a 2nd-row passenger easier entry and exit. All 2016 Sienna minivans have three rows of seats and accommodate seven or eight passengers. Seven-passenger models have a pair of 2nd-row captain's chairs, while 8-passenger models have a bench that seats three. With last year's update came a more premium, contemporary feel. This is apparent in high-end Limited trims, whose spacious 2nd-row captain's seats even boast fold-out leg support. They're like rolling easy chairs. Toyota's minivan features four LATCH points for child-safety seats, while up front Mom and Dad have a commanding view and easy access to audio/climate controls. In back is ample storage behind the third row. Some of the KBB.com editors think the Sienna is the best-looking minivan on the market, and some think it’s downright stylish. Subtle design changes that came with last year's freshening include updated grille, headlight and taillight designs, applied variably throughout the line. The sport-themed Sienna SE actually sits a bit lower and features side skirts that make it look lower still. 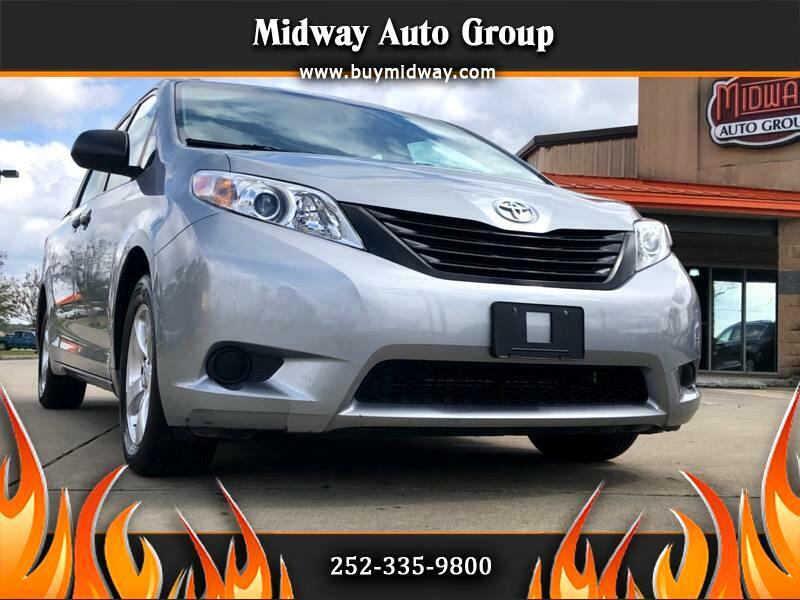 A base 2016 Toyota Sienna L comes with a 6.1-inch touch-screen Entune infotainment system – with a USB input, Bluetooth connectivity and integrated rearview camera – 3-zone air conditioning, cruise control, keyless entry, and six cup holders. In addition to eight airbags, the Sienna’s standard Star Safety System includes stability and traction control, brake assist and Toyota’s Smart Stop Technology, which helps halt the vehicle even if the accelerator is depressed. As with other new models from the brand, the Sienna comes with Toyota Care: two years or 25,000 miles of complimentary scheduled maintenance and two years/unlimited miles of roadside assistance. Among the 2016 Sienna’s options are an ultra-wide rear-seat entertainment system that can play two movies side by side (Blu-ray capable), power tailgate, dual front/rear moonroof, blind-spot monitor with rear cross-traffic alert, 2nd-row captain's chairs with deployable footrests, and a variety of Entune infotainment upgrades ranging from premium JBL sound to integrated apps like the new Scout GPS that enables navigation by utilizing a smartphone. The Sienna also offers the minivan-exclusive Driver Easy Speak function, which subtly amplifies the driver’s voice through the rear speakers. A radar-based pre-collision system and dynamic cruise control are available at the top of the range. The 2016 Toyota Sienna features a 3.5-liter V6 that makes 266 horsepower and is linked to a smooth-shifting 6-speed automatic transmission. Front-wheel drive (FWD) is standard, with AWD optional. The Sienna’s towing capacity is 3,500 pounds. The Sienna earns up to 25 mpg on the highway. While that's better than many full-size SUVs, it can't match the 28-mpg rating of the Honda Odyssey or the 27-mpg best of the Nissan Quest. A base 2016 Toyota Sienna L has a Manufacturer’s Suggested Retail Price (MSRP) starting just shy of $30,000, including destination charges. On the other end of the Sienna spectrum, a fully loaded all-wheel-drive Limited model can top $47,000. These prices are roughly in line with the Honda Odyssey and Chrysler Town & Country, while the Nissan Quest, Kia Sedona and Dodge Grand Caravan start a few to several thousand below the Sienna. The smaller, less feature-laden Ford Transit Connect also starts several thousand below the Sienna. Before buying, be sure to check the KBB.com Fair Purchase Price to see what others are actually paying for the 2016 Sienna in your area. Down the road, the Toyota Sienna is expected to be the leader of the pack in terms of resale value.